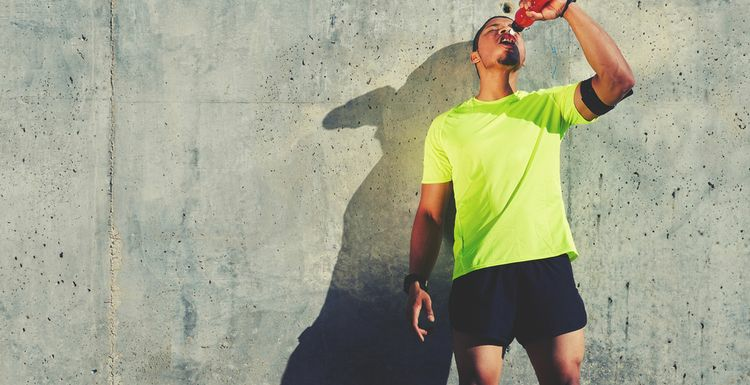 Finishing a marathon can take its toll on your body, but consuming the right food and drink can help offset the worst effects. It can take up to 3 weeks to recover properly from long-distance runs, so it’s not just about one slap-up meal after the run either. Try to consume some carbohydrate-packed food 30-60 minutes post-race. This is the so-called “Window of Opportunity” when muscles are especially good at taking up carbohydrate, helping to replenish glycogen, stabilise blood sugar levels, and repair muscle tissue that was depleted during the marathon. Choose anything easy to consume and quickly digested, aiming for around 200-300 calories. This could be in the form of bread, bagels, baked potato, pasta, carbohydrate sports drinks, raisins, cereal bars or bananas, half a turkey sandwich or even thermos of soup if it’s cold. Nibble at fruit, which is loaded with easily-digested carbohydrates as well as micronutrients and anti-inflammatory properties to help ease sore muscles. Mix with Greek yoghurt which is a great source of carbs, as well as being high in protein. Muscle cells continue to refuel at a slower rate for up to 24 hours, so continue a steady stream of carbohydrate-based meals and snacks through the day. For the technically-inclined, aim for 1-1.2g of carbohydrates per kilogram of bodyweight in the first four hours. You will also need to replace electrolytes lost through sweat to help balance sodium levels. While sports drinks can do this, milk has been shown to be the best choice after exercise. It provides carbohydrates, proteins, vitamins and minerals, and research has found milk to be a very effective rehydration drink as the protein in milk helps retain the fluid. Drink 500ml of milk within 30 minutes of your marathon. This will help reduce soreness, as well as improve physical function in the 1-3 days post-run. Chocolate milk is one of the best post-workout drinks so take advantage and enjoy it. Marathon running can deplete the body’s protein stores so it’s important to refuel with high-protein snacks quickly. The recommended amount of protein post-workout is 10-20g of protein to optimize the recovery process. You will get this from a yoghurt-based smoothie, handful of almonds or sandwich filled with lean meat, peanut butter, egg or cheese. Some Greek yoghurt with granola and berries will deliver twice as much protein as standard yogurt, as well as the necessary antioxidants to fight DNA damage from the stress of running 26.2 miles. To sum up, ensure you rehydrate and consume a good source of carbohydrate and protein within the first 30-60 minutes. Continue nibbling these foods for the next 24 hours. Add in a hot bath and good night’s sleep and you’ll be well on the road to recovery. Lauren is a keen endurance athlete and qualified Personal Trainer. She has many long distance races and half marathons under her belt. Recently Lauren ran the Race to the Stones, the UK's largest ultra marathon - 100 kilometers no less - which in turn has ignited her love for trail running. Lauren works hard on core conditioning and believes this is key to being a strong endurance athlete. Lauren heads up a ladies-only running group http://www.runlikeagirl.org.uk/ and is a big advocate of the Couch to 5km programme. I would say that skimmed milk, or semi-skimmed, would be better than full-fat. Too much fat would probably take longer to digest, which might hold up how quickly it hydrates your body. that's interesting about milk being the best drink after exercise. Does this have to be skimmed milk? Or would full-fat be okay too? thanks - first marathon soon and I admit I am a little nervous of the state I might be in afterwards.